Adventure Time Review - "Princess Day"
Good news: It's a Marceline episode! Bad news: It's also a Lumpy Space Princess episode. You know the drill, spoilers ahead. It's not that I want to hate LSP, I don't want to hate anything. I like Adventure Time, I like it a lot, and I wish it were even better than it already is, but every time LSP is on screen, she just brings down the rest of the show. It didn't even bother me so much back when she used to be a bit player, or have her own mostly-standalone episodes, I even really liked "Bad Timing" because it actually presented LSP as what she is, a crazy person. But this is three appearances in a row now where she's brought down an episode that should have been much better. Her appearance in "Breezy" was by far the worst part of the episode, and I'm still really uncomfortable with the way she forced herself on Finn. If that's supposed to be the point, then fine, but with each appearance I become less convinced that there's some grand plan for LSP in the future, and more convinced that Pendleton Ward just thinks this character is really funny... But she's not. She's not funny, she's not interesting, and honestly, her plot either needs to finally move forward, or she needs to be dropped from the show. Then came "The Prince Who Wanted Everything," which used up one of the few precious gender-swapped episodes, which I've said before can provide so much insight into the characters telling the story, only to inform us that there is nothing more to LSP, she's exactly as vapid and shallow as she appears on the surface. I pointed out why that makes her the least interesting character in the show in my recap of that episode, so I won't go on about it much further here, but needless to say I was unimpressed. Now we've got "Princess Day," and admittedly Marceline is my favorite character on this show (I know I'm not original), so that's the perspective I'm approaching this episode from, but again, LSP has brought down an episode that should have been better than it is. And you know what, "Princess Day" is not even that bad. In terms of LSP episodes, it's one of the better ones, even. 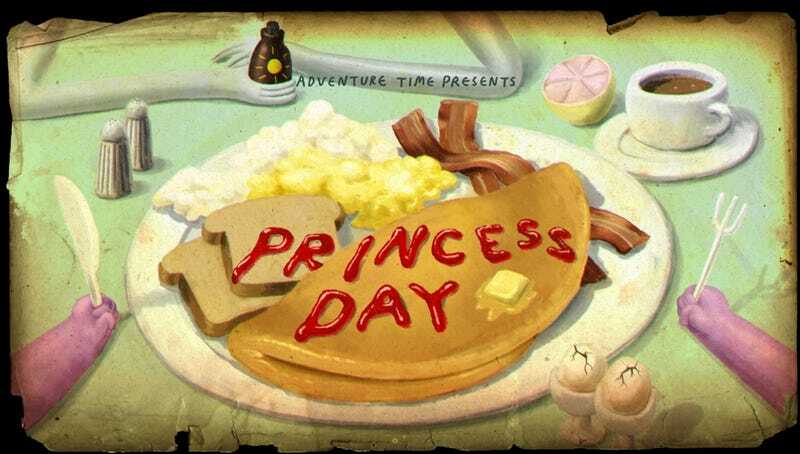 There is definitely some good stuff in here, seeing the Breakfast Kingdom again is fun, the dynamics between the various princesses is always fun, and some of the jokes like the text conversation between Marceline and Peebles had me laughing pretty hard. Ultimately though, I just didn't like this episode very much. I don't even know how much of that to pin on LSP. In fact, the biggest problem with this episode is that the whole thing felt pointless. No one learned anything, no characters were really developed, and I didn't find the whole thing funny or interesting enough to justify no progress. Even the song at the beginning felt forced and pointless. It's just a little nothing of an episode, and in such a strong season overall, it can't hold its own weight. I didn't do a recap or review of last week's episode, "Thanks for the Crabapples, Guiseppe," but I feel like it provides a good contrast. It's another side episode which doesn't really focus on our main character, instead spending time with the supporting cast, but whereas that episode managed to tell a good story, make me laugh, and actually get me invested into what was going on with the characters in eleven minutes, this week's episode just seemed to meander along until its (short) run time was up. Some of the elements worked, other didn't. Of course, there's also LSP's presence in this episode. This episode seemed to be trying to do something similar to what "Bad Timing" did last season, show us how far LSP has really gone over the edge, but it doesn't commit as fully, and while some of her comments ("I thought you were bad. Bad people don't stop.") show that, it really only amounts to telling us what we already know. Therein lies the problem. LSP, as a character, has been stagnant for a long time now. "Bad Timing" was the first episode to even try to do anything interesting with the character since "The Monster" and that was three seasons ago! If LSP needs to stay on the show, fine, I get that, I understand she has her fans who want to keep seeing her. I just want to see this storyline go somewhere. Show some sort of growth. Or, if not growth, just some sort of progress. The wheels have been spinning on LSP's story for a long time, now, and I just have to question whether it's actually going anywhere. This was originally posted to Whereinirant.com. This review was a break from my usual recap format, which will resume next episode.